Any tanning addict knows that everything and everyone looks better tan. If that’s not the case for you, we’re all very jealous. A warm summer glow can mask anything from a few pounds gained to those dreaded dark circles under your eyes. Your heart breaks the moment you look in the mirror and realize your beautiful summer tan has already started to fade. To keep that glowing skin and those gorgeous freckled cheeks all year long, check out these five easy and effective sans sun tanning options. Presenting the basic, yet effective (if done correctly) spray tan. The beauty with these bad boys lies in how little time they take and how relatively simple the process is. A common misconception with spray tans is that they’ll turn you orange just like Ross in Friends, but this only happens if you don’t properly exfoliate your skin before the treatment. So if you find yourself in a time crunch and want a quick fix for a special occasion in these winter months, invest in a spray tan. Tanning lotion works great if you want a more gradual and darker tan or if you just don’t want to pay as much for a spray tan. Simply apply the lotion after a shower or whenever you’re properly exfoliated and rub it in completely. After that, you’re good to go. It really doesn’t get any easier than this. 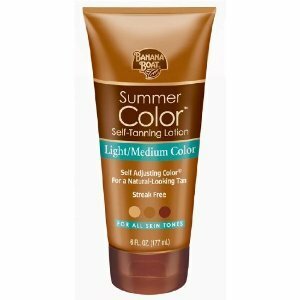 “In terms of the best kind for the price, I love Banana Boat’s super cheap tanning lotion. It’s like $5 at Target and is consistently good. But the best I’ve ever used is Vita Liberata self tanning lotion, it has no horrible smell and it lasts forever,” American University junior Zoë Appler said. Cheap and effective—what more could a college student ask for? Looking to get tan while doing something you already have to do? Me too. Self-tanning body wash is all the rage because of its convenience and effective track record. Like tanning lotion, you’re not going to get the results of a spray tan overnight with a tanning body wash, but with a little commitment you’ll bronze in no time.“I’ve done self tanning at home because it is cheaper and less time consuming but you can’t get the same even application and nice color by yourself,” AU sophomore Alissa Wells said. While self-tanning may not be all sunshine and rainbows, you can always practice, practice and practice for that A1 application. Similar to tanning lotion, bronzing mousse has a silkier and less intense effect but is easier to apply. The mousse dries quickly and doesn’t leave a self-tanning smell. The downside? Your tan won’t last as long as it would with a tanning lotion. “For mousse, definitely Jergen’s instant sun because it’s subtle and it works right away but you have to layer on top of it to get it to stay. The Saint Tropez shower body wash is the biggest waste of money in the entire world and is an actual joke. It does nothing,” Appler said. Steer clear of Saint Tropez’s body wash, but don’t give up. You’ll find plenty of other tanning body washes and mousses in the sea…or the drugstore. I know what you’re thinking—isn’t a self-tanning spray just a spray tan? Not quite. Though you should leave spray tans to the pros, the invention of self-tanning lets you pretend to be a pro and get a good result. You literally spray this on yourself, wait a few minutes for it to dry and then you’re good to go. While it’s extremely convenient, it does take a few times to get a hang of the technique. “Professional spray tans are only worth the money for special occasions, and should be done very sparingly. If you know how to exfoliate and apply it yourself with a glove, you don’t need to waste your money on a spray tan,” Appler said. Finally—you can rest easy when leaves start changing color because your tan isn’t going anywhere.